About three years ago, I made my way to the Maldives for a surf trip. The travel group consisted of a bunch of different people. I had the time of my life in the blue water of the Indian Ocean and I just happened to become friends with two Dutch kite surfers along the way, Jörgen Borsboom and Onno Meinen. They were ok surfers at the time, but their eagerness to learn stood out to me. We kept in touch after the trip and a saw them on a few occasions back in Holland. Fast forward to this November, on another trip, this time to Portugal. A friend of mine told me about Jörgen and Onno being in Ireland for six weeks this winter. They would be waiting there for a big tow-in swell. 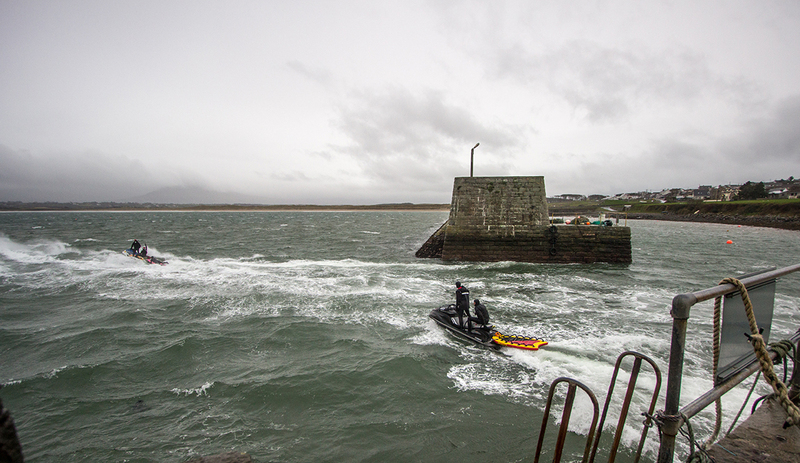 I knew they owned a jet ski and that they had taken a rescue and safety courses with Peter Conroy, one of Ireland’s most experienced tow surfers. It turned out they now owned two skis and would be in Bundoran for all of December. I booked a flight there to arrive two weeks later. 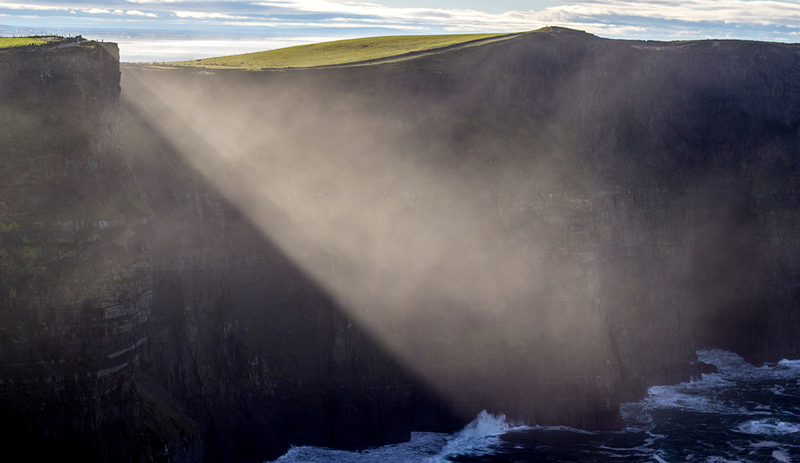 Ireland had been on my bucket list for a while and I was eager to see some of the country’s beauty and its waves. I arrived with two Norwegian friends who were only staying for the first four days of my visit, so we decide to get the most out of our time. We drove through half of Ireland, visiting beautiful cliffs, waterfalls, castles, mountains and the Bushmills distillery. Over the next few days I score a plethora of waves. Pointbreaks, head high barrels, offshore, waves within walking distance of our house and waves an hour’s drive away, we score them all. There seems to be a good wave around every corner. Then I check the forecast on Sunday evening. 20-foot waves are expected to come through on Tuesday with southerly winds. Even though the winds won’t be so favorable come Wednesday, the waves will be getting bigger. My return flight is scheduled for Monday but this is a pretty good forecast for Mullaghmore, the wave I’d been hoping to watch my Dutch friends surf. It looks as though I’ll staying a bit longer. 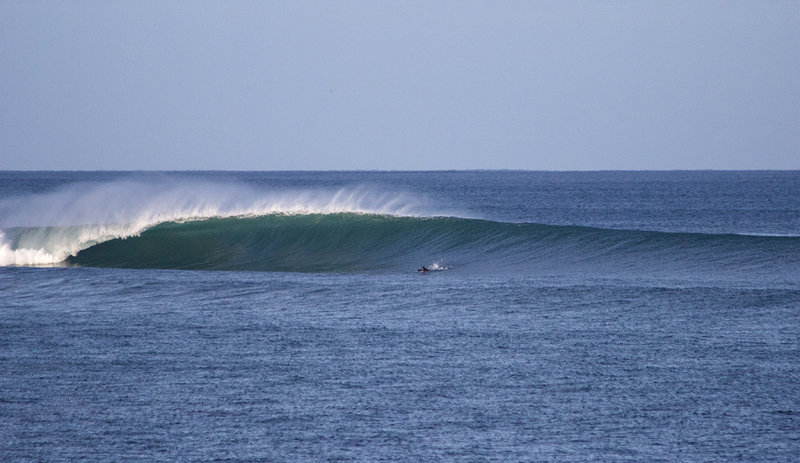 After a morning surf with barrels at the lefthander close by, we prepare ourselves for the big waves at Mully’s. We prepare the jet skis, hook up the trailers to the cars and head out to Mullaghmore after lunch. Big sets start coming through and some locals advise us to wait for another hour before heading out. Tension is rising, both for the boys that head out as well as the guys staying ashore. When the jet skis are offloaded, Onno, Jörgen and Peter drive their skis toward the break. Four others accompany them. One of them, Tome Lowe, is taking his gun for some paddle action and I take my position on the cliff with my camera gear ready. Fifteen minutes later, it’s Jörgen who gets the party going with a 20-foot bomb. Onno and Robert are quick to follow with equally big waves. It’s humbling to watch these monster waves break relatively close to the cliff. Tom Lowe breaks his board after a wipeout and endures a beating, being held under long enough to make us all worry. The sets get bigger and more hollow with the outgoing tide and the Dutchies all proceed to get the waves of their lives. We are screaming like little kids from up on the cliff, watching our friends get barrelled below. Onno gets the wave of the day but is swallowed up by the 20-foot plus barrel. Robert gets the last big one and stylishly cruises down the face on his backside. The boys come back into the harbor full of adrenaline. Content, we discuss the session in the pub with all the locals and check out our photos. Tomorrow will be part two. The next day the swell is even bigger with less favorable winds, just as the forecast had said. This time I take my position on the back of Jörgen’s ski. The wind is gusty and stormy, but that only makes the scene more impressive. The swell is enormous. 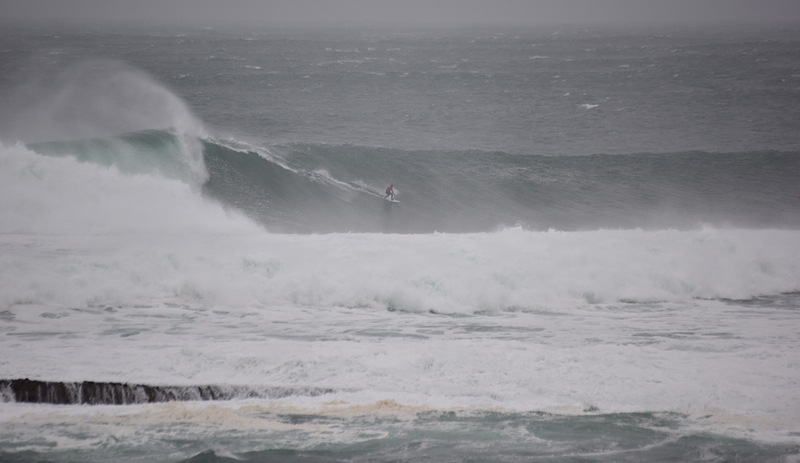 Some of the Irish guys score waves, but the conditions are all pretty messy. Fifteen minutes later the boys signal that it’s just too rough and we all decide to head for the harbor. Once ashore, I realize how close all these guys are. They hug each other, happy that everybody made it back to shore safe and sound. They trust each other blindly, a necessity when surfing a wave that can take your life. It’s satisfying to see that the Dutch guys are part of this bond. 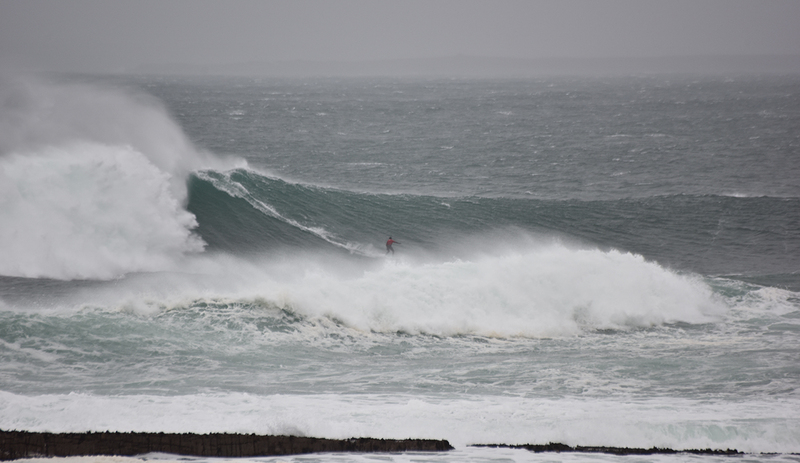 Back in Bundoran, the talk is still about this swell. “Rumour has it the Dutchies got barrelled at Mullys.” The guys have marked their presence on one of Europe’s most notorious waves. What I have come to realize after this trip is how much more surfing has given me. I’ve met so many beautiful people through surfing. 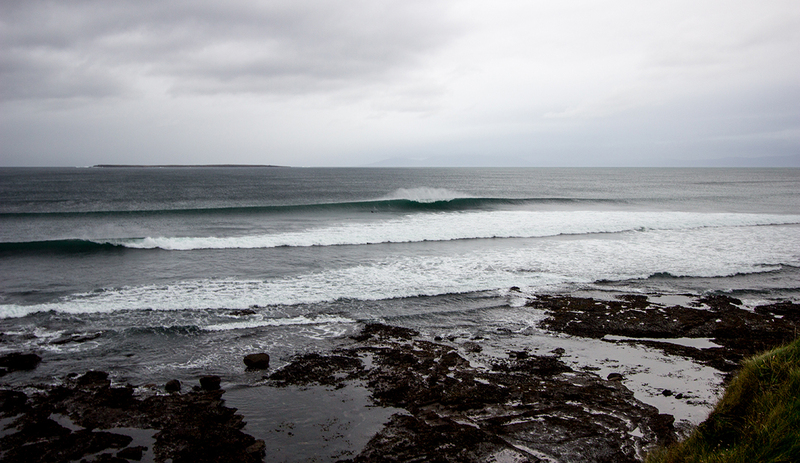 And I don’t even have the urge to surf Mullaghmore myself. Witnessing my friends getting the biggest barrels of their lives gives me more than enough gratification. Ireland, what a way to end 2016.